but popping ball lightning (or at least ball lightning like plasma clouds). These are generated by an underwater discharge of a lousy 60 Ampere (so not for pocket use). 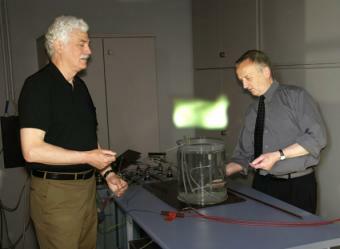 Experiment (and image) are from Max-Plack-Institute für Plasmaphysik (german). An englisch translation is available at physorg.com. You are currently browsing the randform weblog archives for the day Saturday, June 17th, 2006.